After the death of his grandfather, adolescent aspiring artist Jacob (Theo Taplitz) and his family move into the building left to them by the deceased. Since Jacob's actor dad Brian (Greg Kinnear) doesn't make much money, leaving psychotherapist mom Kathy (Jennifer Ehle) as the only breadwinner, the fact that the building comes with a paying tenant is a nice bonus. Another nice bonus: the tenant's son, Tony (Michael Barbieri), an aspiring actor, becomes fast friends with Jacob. Brian's sister (Talia Balsam) is also part owner of the building, and she feels the rent being paid by the tenant is too low. Brian agrees, and goes to Tony's mother, Leonor (Paulina Garcia), with a proposition that he sees as a compromise. Although it would triple what she is currently paying, what he's asking for is still below the market value of the property. It may well be a bargain, but Leonor still can't afford the rent increase. She tries to convince Brian not to raise the price by playing up her relationship with his father to no avail. Eventually things get ugly and uncomfortable. Despite all this, the two boys remain friends, even joining in a pact not to speak to their parents until the situation is resolved satisfactorily. That's the plot of LITTLE MEN. What the film is really about is Jacob learning that sometimes there aren't easy solutions to difficult problems. The "right" thing sometimes depends on what perspective you look at it from, and even if you make a decision that's right for you, it may still come with negative repercussions. 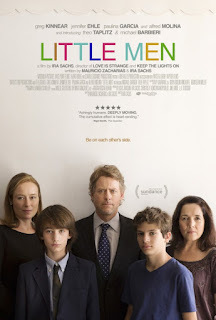 The cast is first rate, and writer/director Ira Sachs does an excellent job at portraying a little slice of reality. It's also appreciated that he doesn't get up on a soapbox and try to sway you to one side of the conflict he portrays or the other. In fact he seems to be saying there really is no outcome that would be satisfactory to everyone. Unlike in Hollywood movies, that's often how it is in real life. It may not be a "fun" viewing experience, but it's a true one. 3 out of 4 stars.